In some respects, I've spent my life striving not to be eccentric. In fact, I'll bet that most people would say I'm fairly centered, normal, conventional, even traditional. I tend to be orderly and predictable, stable and dependable. Innovative I am not. A man with a flair, not me, at least not usually. I like classic things: cotton button downs, cuffed trousers, things that fall into the tried and true categories. Beneath all of this, I suspect, lurks a fear of the unmanageable and unpredictable. In some of my weaker moments, I am pretty change-averse, I'll admit it. I like right angles and when pictures hang straight. Messes bug me. I prize punctuality. My car may not be clean right now, but it is neat. Okay, enough confession. As I grow in faith, I realize more and more that following Jesus Christ calls me out of my comfort zone and out of the world of Carl-in-control (which as comfortable and predictable as it may be, is nevertheless claustrophobic after a while). Following Jesus scares me, in many respects. It forces me to open up my clenched fists, white-knuckling my little life, and live into a world where he is Lord, a world which is often messy and unpredictable, full of obtuse angles and unexpected surprises. I dread this--and I desperately long for it. For in the end, I think that Carl-in-control is a persona, not a person, a construct that through nature somewhat, but nurture mostly, is a false idol who's erected a little kingdom and mistaken it too often for the kingdom of God. Does this make sense? Our trip to the Holy Land next week pulls me off center and out of the little orbit that is my normal life. It stretches me to remember that Jesus is in control, that his kingdom is global, and that what he requires of me is trust in him and love for God and others. Eccentric literally means off-center or out of the center. In the last analysis, discipleship means living Christocentrically, with Christ at the center calling the shots, not me. That's easy to forget. And being religious is no substitute for the bold trust of living eccentrically. It's not easy this eccentric life, is it? What are your thoughts? No, I haven't fallen off the face of the earth, nor been raptured at Christ's second coming (even if my amillenial Reformed eschatology might not support that). I've just been busy. Too busy! Lots going on at the church these days and on top of all that my focus has been on getting ready for our Holy Land Pilgrimage February 4-18. 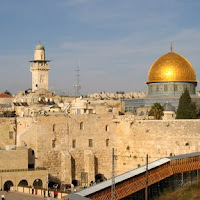 Sixteen of us will be traveling with the Holy Land Christian Ecumenical Foundation (HCEF.org) to visit the "ancient stones" (the historical sites) as well as the "living stones" (the indigenous church) in the lands of Jordan, Israel, and the West Bank. The goal is to demonstrate solidarity and support for the forgotten faithful, the Palestinian Christian church, which dwindles dramatically day by day. We fly into Amman, Jordan and stay initially in Madaba, a Christian village near Mt. Nebo, from which Moses first glimpsed the Promised Land. From there we'll cross into Israel, visiting Jericho, the earth's oldest continuously inhabited city, then Qumran, the site of the Essenes and the discovery of their (Dead Sea) scrolls. From there, much of our time will be spent in the greater Bethlehem area, visiting the ministries of HCEF, meeting with Christian leaders, and certainly, seeing the historic sites of that city and parts of Jerusalem. We'll head north after that to stay in Nazareth and travel through Galilee. I'm particularly looking forward to visiting Ibillin, the village where Archbishop Elias Chacour serves and where he built his university which serves Arabs and Jews, Muslims and Christians. We'll head south via the great dig at Beit Shean, formerly the Scythopolis of the Ten Cities visited by Jesus in his public ministry. We'll finish our time in Israel/Palestine back in Bethlehem and Jerusalem, taking in the Dheisheh refugee camp, the Temple Mount and the Old City, West Jerusalem, and the Yad Vashem Holocaust Memorial Museum. After that, we cross back into Jordan to visit Petra (remember Indiana Jones and the Last Crusade?!) and fly back from Amman. The pilgrimage will be a study in contrasts which I anticipate will be quite transformative. And that's what I need most right now. Given all that's going on at the church, I'm eager to have my horizons re-aligned and my perspective stretched. I need to pan out to the 10,000 foot view of a spiritual Google Earth program, if you know what I mean. I'm eager to get back in touch with the transcendent God whose kingdom of love and justice is spreading out across the earth. I need my heart broken in compassion for those less fortunate than me. And I need to see the legendary faith of the Palestinian Christians, whose trust in God, I'm told, is both deeply inspiring and very humbling. If you're a praying person, please pray for us--for safety, certainly, and health, but also for an openness and receptivity to all God would do in us and through us. During our time in Bethlehem we'll have an overnight in Palestinian Christian homes, followed by worship in their Catholic church. I'm so excited to meet Ramez, the 12 year-old Palestinian Greek Orthodox boy I support. He lives in the village of Beit Sahour and we've exchanged letters. Hopefully, I'll have lessons (and some pictures) to post here when we return.